With sunsets drawing in, I headed out a bit earlier than I've done recently, as my current prime spot sinks into the shadow of the field's owners' house around 7.10pm at the moment, with the sun vanishing behind the treeline about an hour later. But, only a couple very quiet buns over by the aerial installation (but, the guard that drives up occasionally seems quite fine with me shoving a lens up against the gate; I could try sidestepping it, as there's a discreet way to walk around it, but I'd like to keep on their good side), barely one by what was 2011's prime spot, and similarly, only a couple quite quiet individuals by the prime spot. So, I continued wandering around a bit more, to increase my chances of spotting activity, and just enjoying the pleasant evening. I gave thought, all the same, to heading off early, given everybun seemed to've taken the day off. I returned, and found a couple more of that warren had emerged, but as ever, shaded by the tall grass, which obscured their activity from me much of the time. But, between the four of them, there was easily enough activity to enjoy observing, and so I caught a few pleasant, calm moments. And then - some kind of mad flurry of activity, thankfully while within the viewfinder. As quickly as possible, I took the shot, plus a few more in hope. I think I can consider the evening a success. ^_^ It's even, at the moment, on the front page of 500px's selection of popular photos; notifications there are constantly lighting up the iPad. That's a terrific picture. Congratulations! Thanks. ^_^ I'm utterly delighted with the timing, of course - I can't help but giggle at the rather hapless expression of the uppermost bun, finding themselves.. rather free-floating. Not as good a shot, but still quite neat, is from a few moments later - it looks as if one was running/leaping relatively horizontally, but the other's descended upon them, giving a nip. It's fairly astonishing to think of the timing that's involved in it all, even if for rather confrontational purposes. What to use may look like just a leap can indeed be a highly deliberately, precisely timed set of actions and reactions, on a temporal scale we'll never know. That's quite an amazing picture. Hope the field'll stay the way it is! My involuntary response when I scrolled down to the photo in question was "holy crap!" It's one of those amazing fluke photos that all photographers dream of getting. I call it a fluke, but of course it's the product of long dedication, practice and technical expertise. That is awfully good! I made an unwritable noise indicative of my surprise and amusement when I saw it. 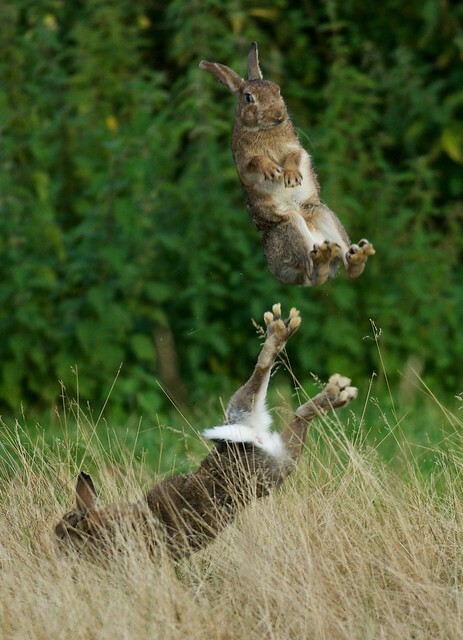 For some reason I always think of these photos not as bunnies in motion, but as scary floating bunnies, like either gravity's given up or it's a bullet-time kinda thing. Looks like Hazel pulled the eject lever right before his bunny crashed into terrain. wow! I am guessing you take all the pictures we get to see then? I didnt know it was from your rabbitteering! *YAY! * You're here! *hug* Ahh, please update more often! You've had such fabulous culinary photos to share in the past, and that's so much easier to read here than elsewhere - all the photos in an entry, along with however much commentary you want to add. Thanks. ^_^ I've really been astonished by the reaction. As a result, I'm taking a fortnight off work (it seems I've got a lot of time accumulated), which I'll be using, at least in part, to finally get the photography storefront sorted out. It's been sitting there for a long while, waiting to be opened to public access. At this point, I may well simply take the RAWs and handle them afresh, though I might consult the original processing. (DxO Optics Pro 8 can work wonders with removing the mild CA issues on the Tamron shots, in particular) And then, there are the candidates for selling since I originally planned that site - Can't Touch Me comes immediately to mind, and maybe one or two landscapes. Which software do you use to process the raw format ?